Some paintings related to the Loch Ness Monster came to my attention recently, so I thought I would post them here. 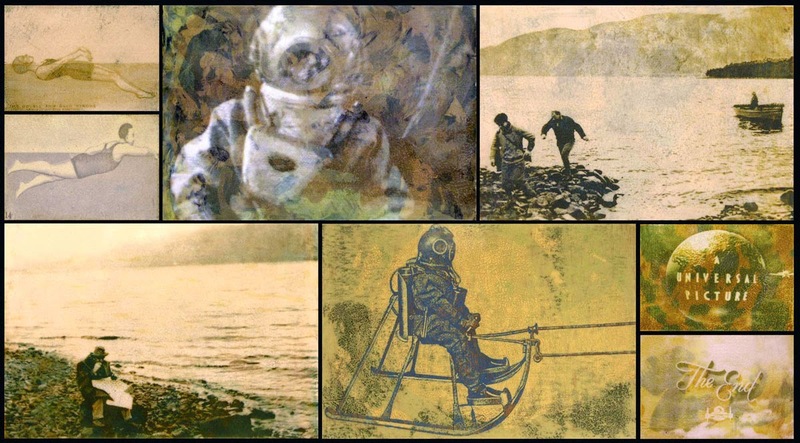 I painted this image to mark the 80th anniversary this year of the beginning of the modern era of sightings of the infamous occupant(s) of Loch Ness. Hugh Gray's photograph of the creature he saw swimming in the loch in November 1933 set the world's media alight with talk of the LOCH NESS MONSTER. My own interest in the creature(s) began in early childhood thanks to stories told to me by my great aunt and uncle who swore they saw a large animal swimming in the loch whilst they were on a touring holiday of Scotland. My main aim was to portray the most commonly observed characteristics of the creature reported by the many eye witnesses over the years! I asked him for any further details he had on his great aunt's sighting, but he had nothing more to add. You can find more of Andy's artwork here. Our next artist is regular reader, Bradford Johnson. He continues to work on his portfolio of Marmaduke Wetherell and has added some ideas from that classic Nessie film, "The Secret of the Loch". You can find more of Bradford's work here. Finally, one of the more unusual Loch Ness Monster paintings from the Italian magazine Domenica del Corriere of the 19th December 1954. 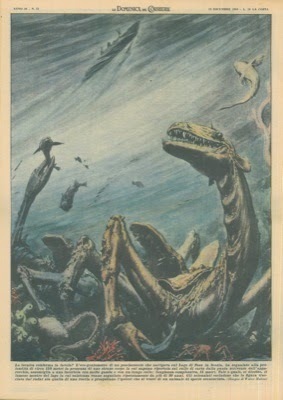 This magazine has produced various cryptozoological pictures over the years. Anyone care to classify this creature? It looks like a crustacean to me!